Look for a solid record of profits preferably over five years. 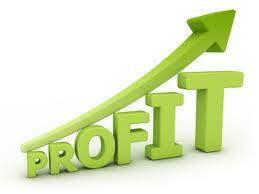 Be wary of downturns in profits in the last year, last six months or even in the last quarter. Studies have shown you will do better, all other things being equal, to select companies with both a higher yield (meaning higher earnings relative to the price you are paying) and a higher return on capital (meaning higher profits relative to the company’s assets). Profit and loss statements are part of annual reports or half yearly/quarterly reports which are usually carried on company websites. Our website provides easy access to annual report sections in company websites. Look at 5 year summaries for the longer term trend.